UPDATE: Community resistance has resulted in a temporary win! Click here for more information. The Inuit community of Clyde River are trying to use the court system to stop offshore oil and gas exploration in Baffin Bay and Davis Strait. Their request for an injunction against proposed seismic surveys was heard on Monday, April 20 at the Federal Court of Appeal in Toronto, at 180 Queen Street West. The Clyde River Solidarity Network organized a rally outside the courthouse at 12:00 noon to show support for Clyde River. Supporters were also invited to bear witness to the hearing inside the courtroom, which began at 9:30am at Suite 200 at 180 Queen Street West. 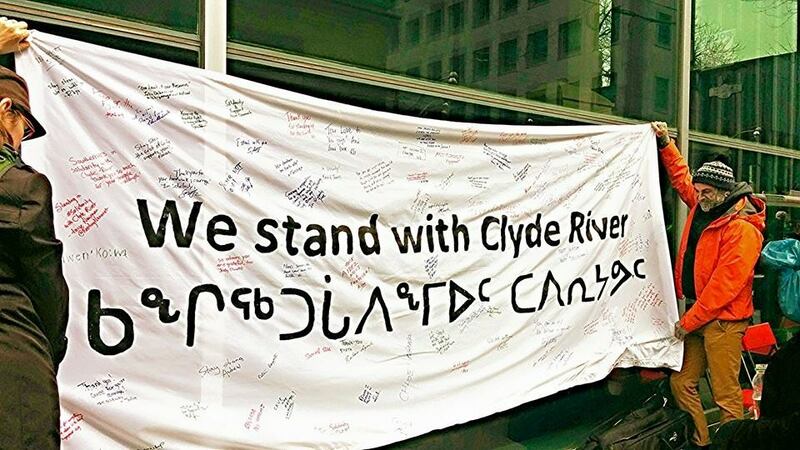 The Clyde River Solidarity Network is an alliance of advocacy organizations, formed in March 2015 to support the Inuit of Clyde River in their struggle against seismic surveys.